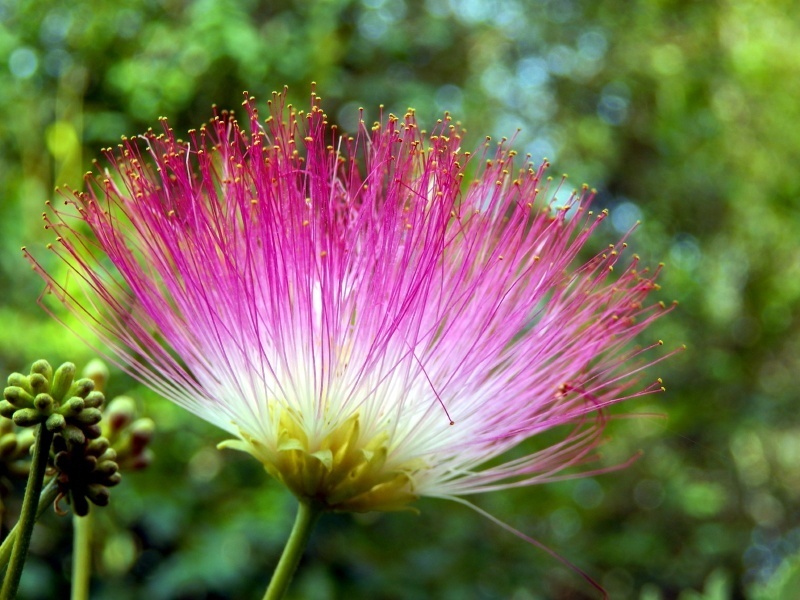 The Mimosa Tree is a stunning show of flower bursts, which are often compared to starbursts or fireworks. This small to medium-sized fast growing Mimosa Tree displays the most beautiful pink flowers in the depths of summer. Butterflies, bees, and hummingbirds will flock to these flowers, which show off bright, tight clusters of pink to yellow-tipped stamens. Frequently known as the “silk tree”, the stamens of the flower are reminiscent of silk threads. The Mimosa Tree has unique palmate leaves, which appear as tiny fronds similar to the leaves of palm trees or fern plants. Texture is a large aspect of why the Mimosa Tree has gained popularity throughout the United States. The 20 to 30 small leaflets provide a detailed background on which the bursting colors of the Mimosa flower blossom. The Mimosa Tree is known by many other names throughout the world. Its Italian namesake, Filippo degli Albizzi, provides it a portion of its scientific name, Albizia julibrissin. The other part of the name is derived from a Persian word meaning “silk flower”. Commonly found throughout the world’s warmer climates, the Mimosa Tree is a popular ornamental flowering tree. It is also fast-growing, making it an irresistible choice for many homeowners. For gardeners hoping to provide dappled shade for smaller plants, the 20 to 25 foot tall Mimosa Tree provide the necessary height, shape, and leave density. It is always a beautiful addition to the garden. These drought-resistant and fast-growing trees do produce beautiful flowers, which when coupled with its small fruit and leaves, can create the need for a clean-up routine. Well worth the clean-up and pruning, Mimosa Trees are positively beautiful when planted as either a central focal point in the yard or in a row as a border along entryways or fences. Enjoy the luscious pink blossoms in summer and the gentle shape throughout the year. Sunlight – Mimosa Trees prefer full sun; in drier regions, some partial afternoon shade for the tree may prove beneficial. Soil – The adaptable Mimosa Tree prefers moist, well-drained acidic soil; however, the tree is often successful in a variety of other soil conditions. Water – The drought-tolerant Mimosa Tree prefers at least an inch of water a week; however, it is able to withstand mild to moderate droughts with relative ease. Pruning – Pruning should occur in winter, while the tree is dormant only after it is established (3 years). Remove dead or diseased wood. The Mimosa Tree, which originated in southwestern and eastern Asia, prefers the warmer climates. The tree is now commonly found throughout many regions of the world, and it can withstand brief cold spells. In the United States, the Mimosa Tree prefers USDA Hardiness Zones 6 through 10, preferring the subtropical to tropical climates of much of the lower latitudes. Plant the Mimosa Tree in an area that receive full sun, though some partial shade, especially in the driest regions of the southwest, can be helpful to the water retention of the tree. The Mimosa Tree is best suited as an accent plant, where its ornamental beauty will not be lost. For many gardeners, this may mean a center-garden or center-yard spot. The Mimosa Tree can also be used to line entryways or driveways, and its uniform shape allows it to pair nicely with others in its species. Mimosa Trees prefer the moist, well-drained soil typical of loam. With regard to pH, the tree enjoys slightly acidic soil. Despite these preferences, the Mimosa Tree readily adapts to various soil conditions. Water is not as much of a concern for the Mimosa Tree. In fact, short dry spells will not harm this tree since it is drought-resistant. Like most flowering trees, the Mimosa prefers at least an inch of water a week in the form of rainfall or irrigative services. If the region in which the tree is planted is prone to severe droughts, consider investing in an irrigation system that will not only help control the flow of water, but disperse it to the Mimosa during those truly hot, long-lasting droughts. The Mimosa Tree is a beautiful ornamental plant. When considering planting locations, look for one where its beauty will shimmer! The Mimosa Tree is a small to medium sized ornamental tree. It is also exceptionally fast-growing. Expect the tree to quickly reach between 20 and 25 feet in height and 10 to 20 feet in width. The growth rate of the tree is fast, frequently earning the Mimosa Tree as much as 5 feet in a growing season! The Mimosa Tree is known to be a hardy, disease-resistant ornamental tree. Despite these benefits, there is one vascular fungal disease that can affect the growth of the Mimosa Tree. Mimosa Wilt is the most fatal of the diseases to impact the Mimosa Tree. The leaves of the Mimosa will yellow and wither before midsummer, often interrupting flowering. Many trees die quickly after wilting is observed, though most die branch by branch. Diseased trees in advanced stages of the disease’s development may produce ooze from cracks in the trunk. Using a balance fertilizer can help to reduce the likelihood of the Mimosa developing this wilt. Water frequently and remove diseased wood. 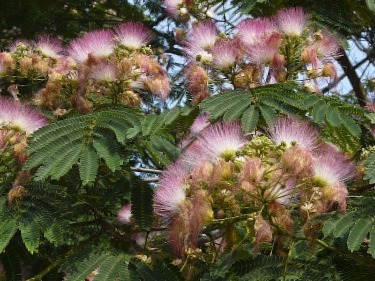 – The Mimosa Tree has several cultivars that have become popular, including the ‘Summer Chocolate’ and ‘Ishii Weeping’. – Mimosa Trees produce seeds that are enjoyed by many wild animals, including birds. – In some regions of the world, such as Japan, the Mimosa Tree has been labeled ‘invasive’. – Birds, butterflies, and honeybees will flock to the sweet nectar the Mimosa Tree produces, adding a wildlife scene to the garden environment. – The seeds grow readily, which is part of the reason the tree has been labeled as invasive in some areas. Researchers are currently cultivating a non-seed bearing Mimosa cultivar that will be able to provide the same stunning beauty without the risks! I have a full grown mimosa Elephant Ear Tree….south-west exposure in California…..It is giagantic…no seed pods or flowers for this type….It is the end of March and there is still no new leaf growth…..Tree dropped leaves in Sept/Oct….and remains almost bare except for a few leaves up high…..and they look like old leaves…dried out…. When will this type of tree begin its regrowth…. ?…..and when should I be concerned? It gets water 2-3 times a week 5minutes…..At the moment my irrigation system needs repair because one of the roots broke pipe. Thank you…..I will await your response….. I am trying to find the same answer. I am having the same trouble with my mimosa tree. I am worried that it has died and I can not find an answer on when it starts to produce again and comes out of dormancy. If you were able to find out some answers please respond back to me. My wild memosa has leashes in east Texas with small buds. She shed early last year and I was delighted to see she made it back! i have had a Mimosa for more then 15 years. It just grew from out of the blue. I assume a seed must have blown into the yard. It happened to land by a small pond and of course it does resemble a Palm tree. I always loved it. It is not full like the pics show. It is a little sparse. But after all these years this is the first time it has bloomed, it is spectacular. I believe it does not have enough space for the roots. It is right on the edge of a small retaining wall, and up against the house. So why did it take so long to bloom? Anyone???? I have a chocolate Mamosa tree that is just tall and skinny and spindly how can I make it fill out better? I live in Omaha, Nebraska and would love a mimosa tree. Our summers have become hotter and our winters normally milder with little snow. Would it work here? Ours has small yellow spots on the leaves, same as last year. We’ve had it a year. Anyone know what this could be? I have a Southern Mimosa Silk Tree in my front yard in South Carolina. 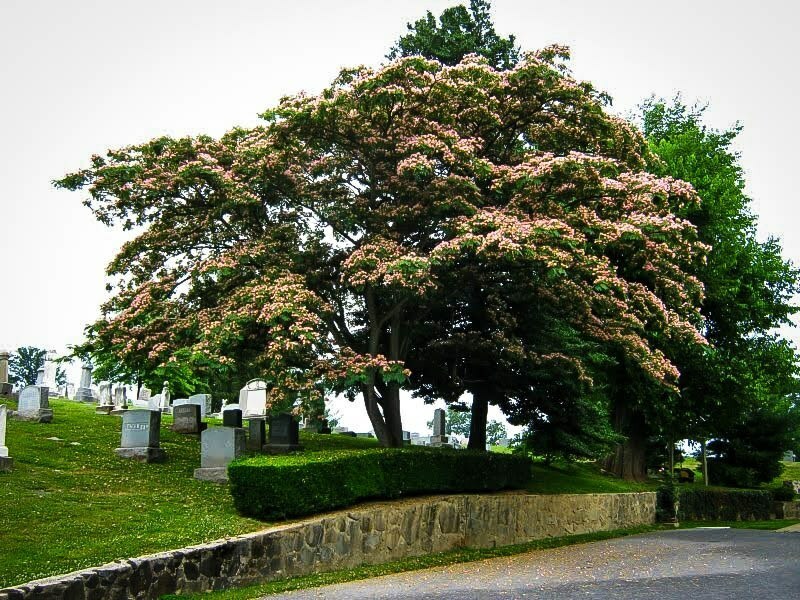 It was beautiful about a month and a half ago – cascading branches and pink flowers throughout. My daughter trimmed the branches against my will while tree was in full bloom. I returned to find the tree dead looking and brown pods all over the entire tree. My question is, is the tree just dormant or is it dead? 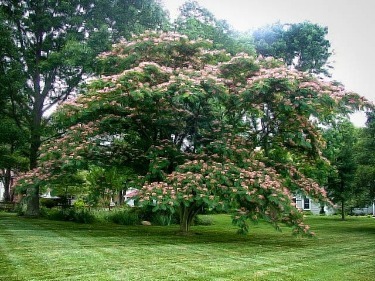 It’s strange because I have another exact tree and it is still totally green and covered in the pink flowers. Also I have livestock, are the pods dangerous that have fallen on the ground? Please advise, thank you so much. We had a beautiful mimosa for about 7 years in our back yard in vancouver canada. Always bloomed quite late but It grew fast and made a wide shady canopy. No problems except that wood bugs love the sweet inner bark, weakening it. Thought i had it under control but then one one wind storm it cracked in two. Heartbreaker. Thinking about trying it again all the same.